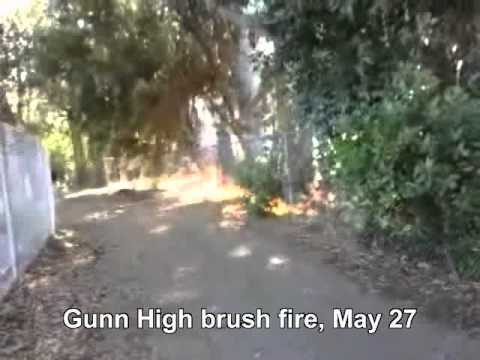 A grass fire broke out behind Gunn High School in Palo Alto at about 4:30 p.m. Friday (May 27). Four fire engines responded and quickly doused the blaze. Gunn 11th-grader Kareem Fawal witnessed the fire. He had just been dropped in the school parking lot around 4:37 p.m. when he smelled smoke. Intentional arson? Careless pot smokers? 4 Engines to put out a fire that looked like it was a BBQue. Fantastic waste of tax payers dollars that overstaffed fire department is. for next time, what you do is grab a rake and create a fire break to keep it from spreading. Its pretty easy to do if you access some simple gardening tools. Did you see where the fire was located, did you notice the trees involved? I'll give you a hint, non native tree known to burn like an oil soaked rag. The fire dept gets it's calls via 911. The people who report the emergency often don't give correct information and or over state or under state the true nature of the emergency many many times. If the person who reported the fire said buildings were threatened then the FD sends pretty much the same amount of people and equipment they send to a building fire. Better to start or send more resources and cancel some units after the FD gets on scene and actualy sees whats burning, then to send one engine and three people THEN after they get there see more resources and people are needed. Then its a constant catch up. If the FD had sent one piece of equipment with three people on it and the fire ended up being much bigger or had grown from the time of report, and burned down a building at Gunn or a house or houses in area I'm sure the FD would be taking flak for not handling the incident. One engine with 500 gallons of water and three people is not enough to handle fire of any size. The fact this fire was located at or near a school means the FD will send a full response. Schools have large number of kids. America has had a tragic record of deadly fires at schools. The smoke alone off those trees could cause injury and or death. VA Hospital is located right next to area involved. Not to mention fields, buildings all over that area with wood shake roofs, etc etc etc. Anyone can Monday morning quarterback any event, in all fairness one should look at when, where, what time and who reported the incident. Location, time of day, wind/weather conditions, etc. Again a dispatcher has to take a 911 call and figure out who and what to send based solely on the information the reporting party calling 911 is telling them. The Mercury-News says 3 people were seen running from the scene of the fire. And the fire was in a eucalyptus grove that could easily have exploded if the fire department didn't take care of it quickly. There needs to be a warning about the profanity in the video. When I was at Gunn that area was known as "The Path" and based on what people did there, I'm not surprised a fire was started. I have seen a lot of students in that area smoking. No surprise about the fire.